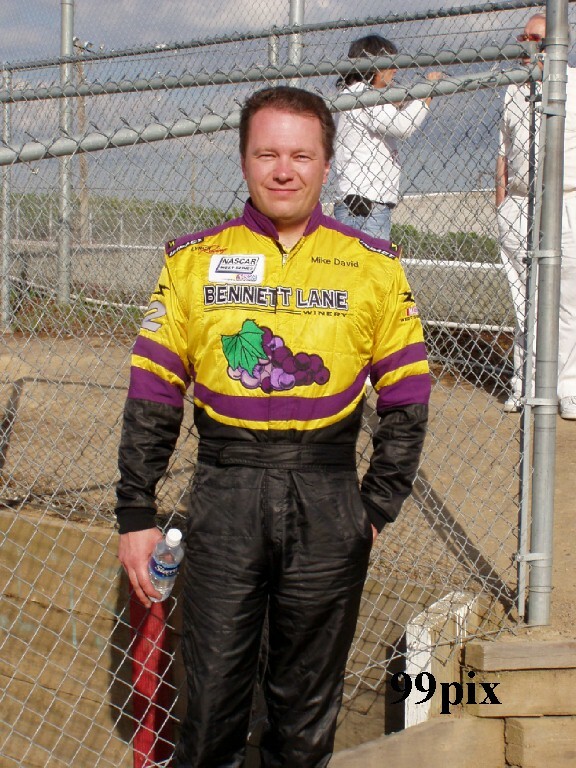 STOCKTON, CALIF. (April 30, 2005) Auggie Vidovich from Lakeside, Calif. dominated the action for the second race in a row to claim his second victory of the season in NASCAR AutoZone Elite Division, Southwest Series competition Saturday night at the historic Stockton (Calif.) 99 Speedway. Vidovich maneuvered lap traffic over the final 40 laps of the event en route to a 3.498 second margin of victory over series veteran M.K. Kanke. Two-time and defending Northwest Series champion Jeff Jefferson finished third with Jim Pettit II and rookie Ryan Foster rounding out the top five finishers in the 100-lap AutoZone Twin Championships presented by Havoline. Vidovich, #11, started on the outside front row for the second consecutive race but getting an advantage with a six-car invert. Kanke, #33, Jefferson, and Pettit, #03, waged a spirited battle for third place over the closing laps, but Kanke able to hold the advantage for the runner-up spot. 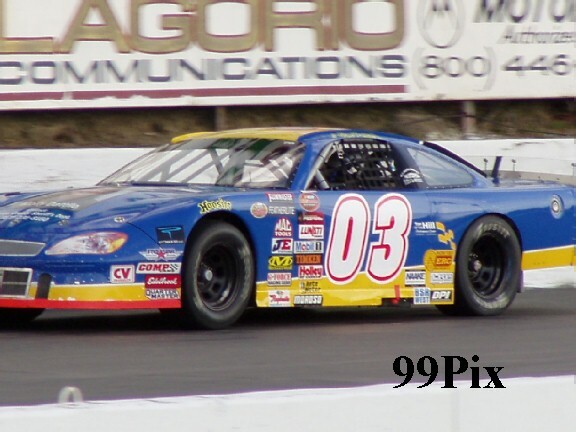 Defending Northwest Series champion Jeff Jefferson rallied to finish third with a loose race car. Jefferson led all drivers in qualifying with a quick lap of 13.692seconds/65.732 mph around the quarter-mile paved oval to claim his first career Southwest Series Bud Pole Award. 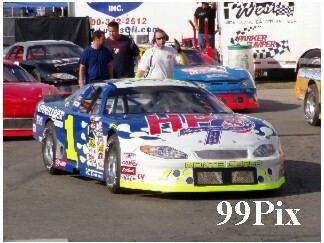 With the victory Vidovich took over the points lead by one over 2004 series champion Pettit. Kanke moves up to third followed by Lamar, #1, and Jefferson. The race took just 35 minutes and 22 seconds to complete at an average speed of 42.423mph. 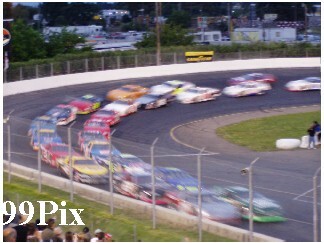 The action was slowed five times for 29 laps of caution. Mike Ledbetter won the $750 PowerAde Award for improving the most positions in the event (13), while Eddy McKean collected the $300 Featherlite Award for improving the most positions from the previous event. 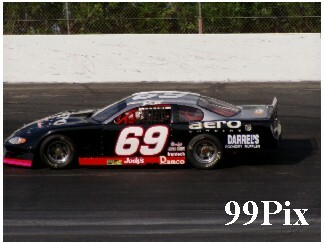 Jeff Jefferson claimed the $400 Bud Pole Award and Ryan Foster was the top finishing Sunoco Rookie-of-the-Year competitor. 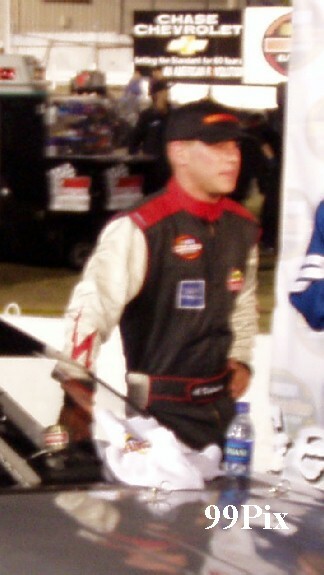 Mike Harvick claimed the Lunati Crew Chief-of-the-Race Award for preparing the winning car. The next event for the Southwest Series is Saturday, May 14 at Mesa Marin (Calif.) Raceway for the second of three visits the series will make to the high-baked half-mile oval. 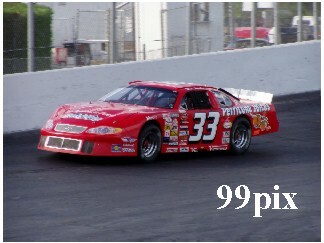 Auggie Vidovich dominated the action in the series’ last visit to MMR while four time MMR winner M.K. 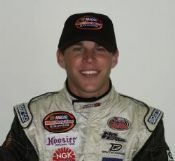 Kanke finished fourth. STOCKTON — Scott Lynch, #08, provided the braun. The Strmiska family provided the brains. 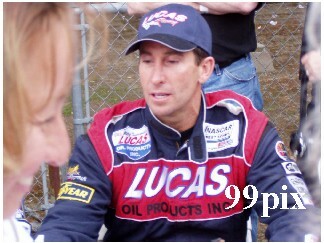 Lynch led the entire 150 laps of the Grand National West race, making up for his last-place finish at Stockton Aug. 14 when he crashed after 27 laps. His crew chief is Manteca's Robert Strmiska, whose brother Ross and father Ron Strmiska Jr. help the team. Their input about the track — Ron Sr. was a two-time track champ and Ron Jr. has won many races at Stockton — gave Lynch an edge. "It's awesome. 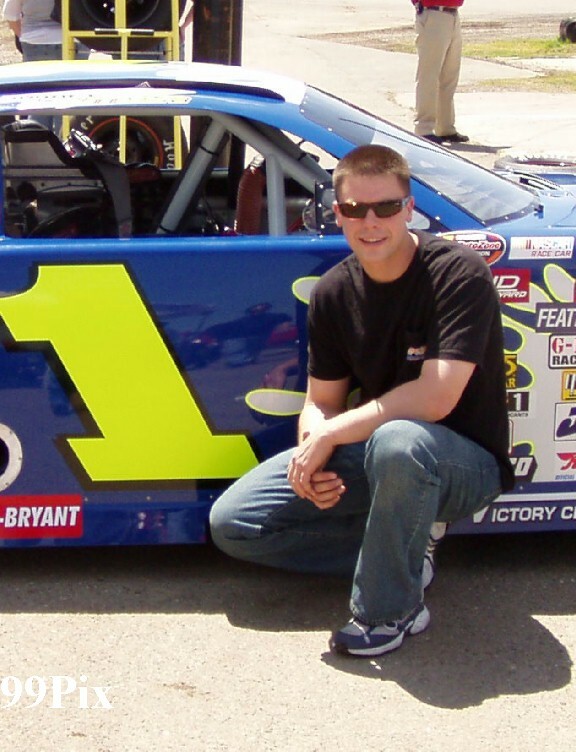 I'm kind of the third generation of Strmiskas to win at the track," Lynch said. "It's great to be able to have that experience." It was the second wire-to-wire finish of the night as Auggie Vidovich won the Southwest Series 100 on a cool night in front of a crowd of about 5,000. 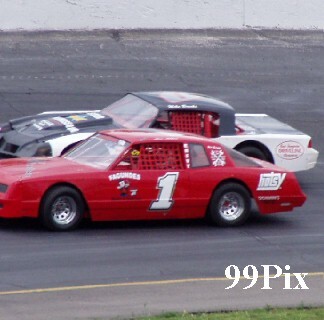 Lynch was not challenged most of the race, though the battle for second was fierce behind him all night. 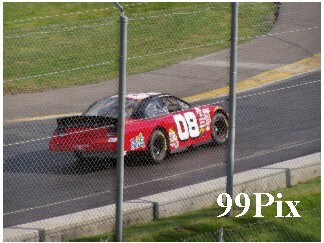 Mike Duncan, #9, finished second for the fourth time, and Modesto's Mike David was third. 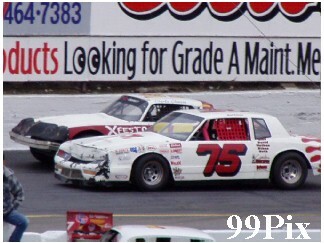 David had the toughest battles of the race, inside and outside his car. 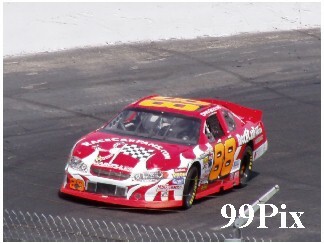 He said his car was "way too loose" in the first 100 laps, but he still managed to get past Riverside's David Gilliland, #88, in Lap 47. 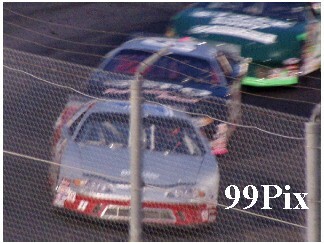 He held off Duncan in Lap 93, but couldn't keep Duncan behind him in Lap 130. A caution with three laps to go made Lynch nervous, but David said he wasn't going to be able to get by Duncan, and just wanted the race to end. It was his third top 5 finish of the season. He is fourth in points. "It's a little disappointing because we know we have a good enough car to win," said David #2, who won the last Grand National West race at Stockton on Aug. 14. "We have a good set-up, we were just off a tick. We made some adjustments and the car was great after the break." David congratulated Lynch by pouring a little cold water down his collar. Lynch said he would have been just as happy racing all 150 laps at one time. The drivers stopped for tires and fuel after 100 laps. Very little needed to be adjusted on Lynch's car. Robert Strmiska said the crew was made at him for changing the car set-up "30 times in the last two days." But he wanted to make sure Lynch avoided a repeat of his last outing at Stockton. "When we came here last year, we didn't have any luck," Strmiska said. "It's my home track. I didn't want to get beat like that again." 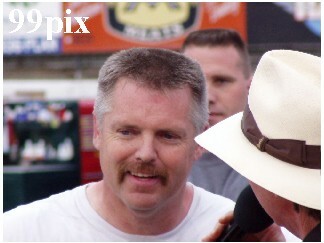 Lynch extended his points lead over former Oakdale resident Steve Portenga to 674-613. 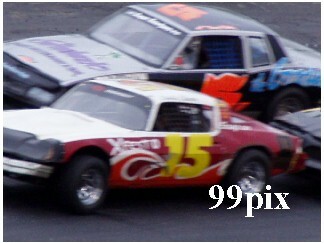 Portenga, #16, skidded against the wall in Turn 4 on the first lap, but stayed in the race and finished sixth. Tracy's Rick Ruzbarsky battled a tight car all night and finished 15th, dropping out of the top 10 in points. Stockton 99 regular John Moore of Granite Bay was 14th. In the last two Southwest Series races, Vidovich has been in no one's rear view mirror. 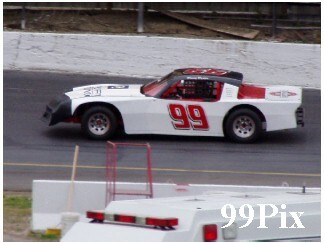 The Lakeside driver led from the start to win his second consecutive race. Fresh off the heels of his victory at Bakersfield's Mesa Marin Raceway on April 9, Vidovich pulled away from the field after top challengers Brandon Riehl, #69, and Burney Lamar, #1, left the race with engine failure. Charlie Clawson, #15, of Modesto won his first American Limited Stock Car main event of the season, and he got to keep it. 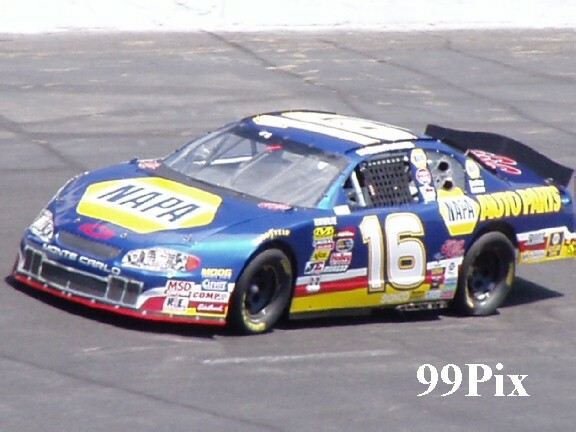 Last season, Clawson won eight races, but was also disqualified four times. So he’s never sure what might happen. "Yeah, you always wonder a little," Clawson said. "We did get disqualified for some little things, but we’re fine." 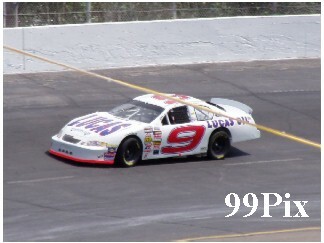 The races first leader was Mike Brooks Jr. #0,of Manteca, then Joe Allen, #1, of Stockton, but by lap-12 Boyd Camper, #4 of Manteca had grabbed the lead. Looking like it was going to be Camper's night, an aggressive mishap on lap-18, sent Camper to the back with Clawson finally taking the lead for good on lap-24. Chad Holman, #75, of Stockton was second in the ALSC main event, and he was followed by Johnny Cordoza, #40, of Manteca and Richard Harper, #5, of Stockton and Jeff Ahl, #31. 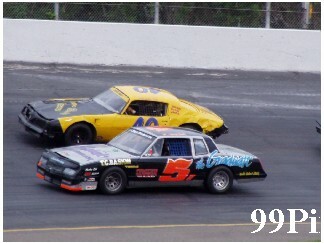 Johnny Cordoza had fast time, a new American Limited Stock Car record of 15.830. 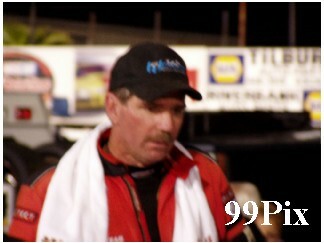 Donny Darter, #99, of Stockton won the ALSC "B" main event. Lodi’s David Sullivan, #16, came in second, Steven Fraser, #12x came in third, Stockton’s Dave Ball finished fourth and Oakdale’s Sheila Wall came in fifth.